Alfred Lerner College of Business and Economics doctoral graduate Jacob Fooks has been awarded the 2015 George Herbert Ryden Prize in Social Sciences, presented annually by the University of Delaware’s Office of Graduate and Professional Education for the outstanding dissertation in the field. Fooks, who received his doctorate in economics at Commencement on Saturday, May 30, is a postdoctoral researcher for UD’s Center for Experimental and Applied Economics (CEAE) in the Department of Applied Economics and Statistics (APEC). 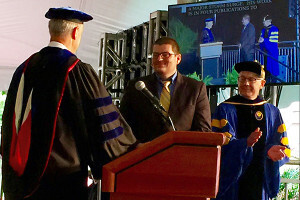 Fooks, who also holds a master’s degree in agricultural and resource economics from UD’s College of Agriculture and Natural Resources, was presented the Ryden Prize during the doctoral hooding ceremony on Friday, May 29. His dissertation, titled “Essays on Computational Methods in Land and Resource Economics,” included several essays on the theme of applying computational models from the natural sciences methods to several problems in economic valuation and regulation. One of the essays looked specifically at sea level rise in coastal protective infrastructure and used complex surging wave dynamics and simulations and data on competitive behavior from research participants to see how better policies and subsidy mechanisms can be developed to minimize damage. Fooks said the study was set up to be fairly generic so that it could be applied to different areas threatened by sea level rise. “It looked specifically at how regulators can subsidize investment decisions that decreases damage, sea walls or dune nourishment, given that individuals may have different, private values for these things,” said Fooks. Of receiving the award, Fooks said, “It was unexpected and I’m very honored. It’s a little surreal but very exciting.” Fooks said that he had many people to thank and that the award was “as much a reflection of the lab and the team here and all the support that I’ve gotten from them. My advisers, Kent Messer and Michael Arnold, especially have been incredibly supportive, as well as both the APEC department and the economics department which I have worked with. And most importantly my family who’ve shared the struggles of graduate school with me for the last five or six years.” Messer, Unidel Howard Cosgrove Chair for the Environment in the Department of Applied Economics and Statistics, said of Fooks receiving the award, “Jacob’s work on a wide array of agricultural, natural resource and environmental economics topics is truly groundbreaking, as exemplified by his impressive publication record and his National Science Foundation dissertation award.” Now that he has received his doctorate, Fooks will begin working at the U.S. Department of Agriculture (USDA) Economic Research Service’s Conservation and Environment branch. Fooks said he is excited to start work and that he will hold a research position with a heavy policy connection, focusing on “both academic publishing, as well as producing policy oriented briefs on what the implications are for federal environmental and resource policy.” In the role, he will also be able to continue to work closely with the CEAE. “I’m sure I’ll continue to work closely with this center, which is really great because it’s been such a supportive environment and place to work,” Fooks said. “We have worked very closely with the group that I’ll been working with in the past – actually I’ve been working with several of my future coworkers more or less since I started my master’s program in the APEC department.” Article by Adam Thomas and Sunny Rosen This article can also be viewed on UDaily.